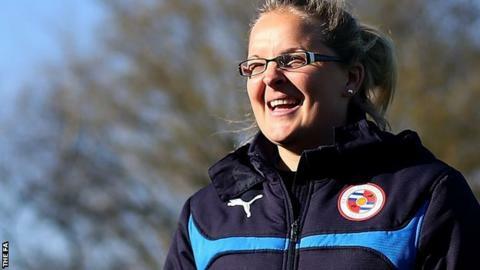 Reading FC Women boss Kelly Chambers believes her side can thrive in Women's Super League One next season, after winning promotion on Sunday. Chambers' side won 3-1 at Watford before a top-two finish was sealed when third-placed Yeovil lost to Oxford. "It's a fantastic feeling. The girls deserve to be where they are today," she told BBC Radio 5 Live Sports Extra. "It's a massive achievement. They have stepped up to the mark and proved that they can compete against that level." Reading are the top goalscorers in WSL 2 this season, with 52 goals from 15 games so far. "It's a massive achievement," Chambers added. "When we stepped into WSL we knew it was a building block to progress into WSL 1. Reading captain Kirsty McGee added: "Every single person who is involved with the this club is absolutely buzzing. "We've worked so hard this season for it. We all fully believed that we could do it. "As an individual, I know we can push on, and we can compete." McGee also explained how Reading ended up "celebrating promotion twice" while checking Twitter for the final score in Yeovil's game. Oxford were winning 1-0 at Yeovil, with 23 minutes of injury time added after a lengthy injury delay, and Reading knew they would be promoted if Yeovil did not score twice. While Reading were waiting for the full-time score to be confirmed, Oxford United WFC's Twitter account re-tweeted a final score from a match involving their development team, prompting premature celebrations from the Royals. McGee and Reading then celebrated promotion for real when the full-time score between Yeovil and Oxford was officially confirmed. "It was actually very bizarre," McGee continued. "Everyone was looking on Twitter, so we could see the results. "People could see that there was (lots of) stoppage time. But actually we celebrated twice. We actually thought that full-time was gone but then we realised that it was (a tweet about) their reserve team, so then we celebrated, but then we realised, and then we did it again."